I always love hearing from readers, but some requests are more unusual than others. 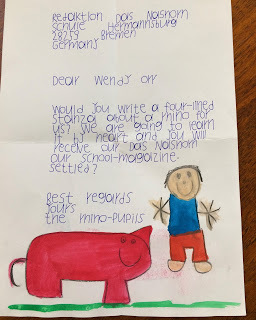 I received this letter from Germany on Friday. 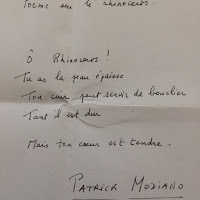 They also enclosed copies of verses they’ve received from Doris Lessing and Patrick Modiano, both writers I particularly admire (as well as the minor detail of being Nobel prize winners). 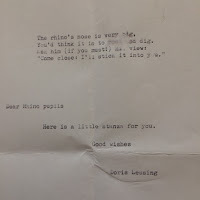 Obviously this has been going for some time, as Doris Lessing died three years ago – and equally obviously, I could not have said No even if I’d wanted to! I wrote a little verse, and then remembered that I had a picture of giving a baby rhinoceros a mud bath on a Behind the Scenes tour of the Australia Zoo, the day of the Return to Nim’s Island premiere. 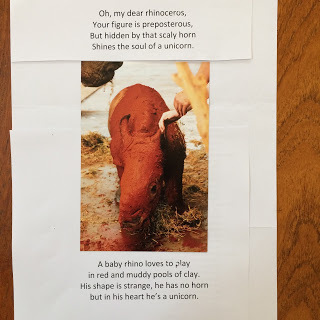 So I wrote another verse about the baby rhino, and am now trying to decide which one to send. Now I have to choose one to send off with this bonus photo – which one would you vote for? Let me know in the comments below. I presume they knew me through these rather lovely editions of Nim’s Island and Raven’s Mountain. 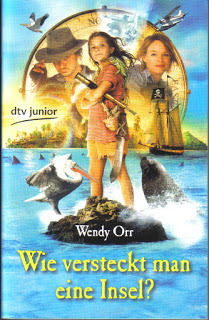 Nim’s Island – How do you hide an Island?